Mort Künstler Hand Signed and Numbered Limited Edition Print:"On to the Shenandoah!" About the Art: In May of 1862, Confederate troops under the command of General Thomas J. "Stonewall" Jackson took part in one of the most brilliant military campaigns in American history, the Shenandoah Valley Campaign. During that time over seventeen thousand rebels marched more than six hundred miles to participate in four major engagements including the Battle of Front Royal. On May 23rd, Jackson's cavalry commander, General Turner Ashby, forded the Shenandoah River and set out to capture a Union depot at Buckton Station. After defeating two companies of Federal infantry, they destroyed the railroad and cut the telegraph wires, isolating the town of Front Royal. With no threat of reinforcements, Jackson boldly moved into the city. With lethal horse-drawn artillery clearing the way, his infantry advanced through the streets, pushing the occupying Federals back. Ashby's cavalry then swept around the Union Army's flank. This tactic created a severe state of confusion among them. Certain of their defeat, hundreds of Union soldiers threw down their arms and surrendered. The result was one of the most lopsided victories of the entire Civil War. Federal casualties were recorded at 773, of which 691 were captured. Confederate losses were only 36 killed or wounded. After the battle, members of the 1st Maryland CSA took charge of prisoners from the Union's 1st Maryland regiment. Many recognized friends and family on both sides. According to a witness, "Nearly all recognized old friends and acquaintances, whom they greeted cordially, and divided with them the rations which had just changed hands." This painting is the third one I have done of Front Royal. The first time I painted Front Royal was in 1999. Covered With Glory was inspired by my good friend Rod Gragg. The painting was also used as the cover for his popular book by the same name. At the time, I knew I would be doing another painting of Front Royal because of the charm and the history of the town. However, with a backlog of commitments, it took ten years before I did The Autograph Seekers of Bel Air. It was one of my most popular prints. It gives me great pleasure to complete On to the Shenandoah! for 2011 and announce that this is the first of a set of two paintings with "Stonewall" Jackson in Front Royal. The second painting will be released in 2012. After seeing photos of the original Warren County Courthouse and finding that the present Courthouse is similar in appearance and was rebuilt on the same location, I realized that it would make a great setting for a painting. Morning rains had made the roads muddy, but the skies were clearing when Jackson arrived at the Courthouse around 2:00 that afternoon. As a border state, Maryland, had Federal, as well as Confederate, regiments in Front Royal at that time. The 1st Maryland CSA was the rear guard for the Federals and wily "Stonewall" ordered the Southern 1st Maryland to the front, to lead the assault. As one Maryland Confederate recalled, "He thus put us on our mettle to show which were the best men and the truest representative of Maryland." The red and white flag in front of the Courthouse is the Confederate Maryland battle flag. The 1st Maryland CSA, as well as the artillery piece from Brockenbrough's battery, rushed forward to the front. Accompanying Jackson was Lieutenant Colonel "Sandy" Pendleton, just under the first national flag. Moving from left to right, on the gray horse is Major Henry Kyd Douglas. Next is Jackson astride Little Sorrel, pointing out instructions to General Richard Taylor, whose Louisiana Tigers assisted the 1st Maryland in the assault. That regiment is coming into the painting in the extreme left background. General Richard Ewell is immediately to the right of Taylor. 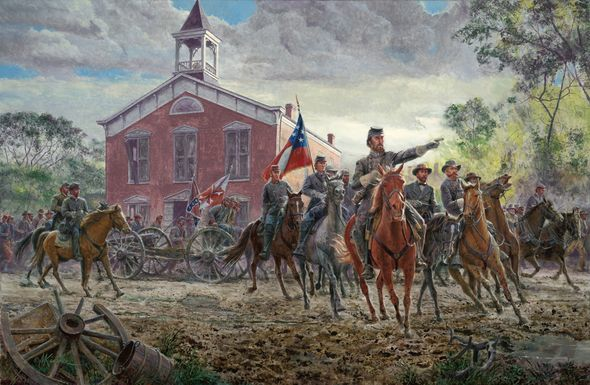 I have used a "V" composition to lead the eye to "Stonewall" with the roofline on Jackson's left and the shape of the trees forming the right side of the "V." Colonel Bradley T. Johnson, of the Confederate 1st Maryland, rides into the painting just to the left of the cannon, having just cleared the Courthouse of Federal snipers. He is on his way to lead the charge down Chester Street. I had a wonderful time not only painting On to the Shenandoah!, but also composing and capturing an original look at "Stonewall" Jackson's much revered Shenandoah Valley Campaign. I would like to especially thank Mr. Patrick Farris, the executive director of the Warren Heritage Society, whose knowledge and insights were essential to the creation of this unique painting. I now look forward to the release of the second painting in this series in 2012.